Nailaholics: Great Argan Sale Year 2 November 28 – December 12, 2017 For a lot of people, the end of the year is when their skin gets the most attention. In part, it’s because as the year winds down to a close, the promise to make an effort to take better care of your skin becomes a big part of resolutions. But mostly because living in a tropical country during the most unpredictable season of the year, where the weather swings from sunny and humid to cold and wet in minutes, on top of all the sugar, alcohol and greasy holiday treats, can really wreak havoc on your skin. Of course, eating healthy (a lot of greens, water, and fiber), getting enough sleep and a lot of exercise help. Unfortunately, the sason to be merry, jolly, and bright is just around the corner, and it will prove nearly impossible to say no to all the revelry. So here’s a helpful insider tip: argan oil. Drawn from trees that grow in the southern region of Morocco, argan oil is a rich blend of antioxidants, vitamin A and E, polyunsaturated fat, and essential fatty acid. It’s literally food for hair and skin, eases inflammation, and gives it a boost of moisture from within that lends itself to an inner glow—the hallmark of healthy skin. The great news is that you can get all the benefits of argan oil can from just mixing a few drops of argan oil into your trusty, go-to beauty products or by directly applying it onto your skin. This makes it a very versatile addition to your beauty routine. 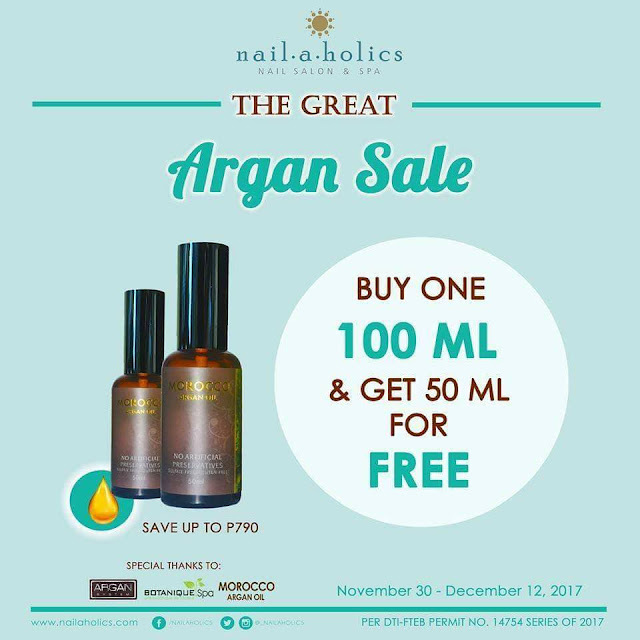 That said, here’s an even better insider tip that is just in time for the holidays: you can get a free 50 ml bottle for every purchase of one 100 ml Argan Oil bottle at any Nailaholics Nail Salon and Spa branch. Each 100 ml argan oil bottle is priced at Php 1,390. Now you get to take home more with the Great Argan Sale, giving you a savings of Php 790 which is the original price of your free 50 ml argan oil bottle. You better hurry though because this exclusive promotion runs only from November 28 to Dec 12, 2017.